Applications - Fluo-Tech Industrial Co., Ltd.
PTFE bearings are best suited for textile machinery bearings which must be kept free of oil and grease. PTFE bearings are oil-free,self-lubricating bearings that do not soil threads or fabrics. They are ideal as bearings for conveyor rollers which are exposed to solvent and chemical vaports. They are also used as bearings in automobile clutch levers, carburetors, throttle shafts, governor controls, etc. Fluorocarbon polymers were first used to make gaskets and diaphragms. Now, being used in piping, wire-braided hose, flexible joints, elbows, and cheese. They are also widely used for the main body and parts of pumps and valves, measuring instruments, and anti-corrosion linings for reactors. PTFE has a smaller critical surface tension than any other plastic and have excellent water and oil repellency.They can thus be used in many ways, such as in the food processing industries. PTFE, which is characterized by its non-cohesiveness, is a valuable material for the food processing industries where sitckly materials, such as flour, cream, candy, eggs, etc., are treated. PTFE is used for kneading and press rollers, cookie molds and sheets, shafts, conveyors, guide plates, hoppers chutes, etc. PTFE is used to make guide rails because of its high lubricity.They are used to smoothly transport containers and packing materials in food processing, cosmetics, and pharmaceutical industries. 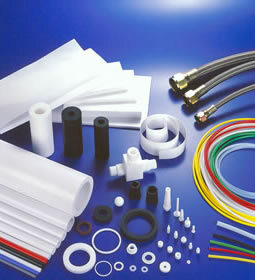 PTFE possess excellent electric and mechanical properties, and are very durable. Because of these properties, they are widely used as electrical insulation materials in compact and high performance machinery. They are used for internal wiring and control lines for heatresistant parts of electrical equipment, as well as measuring instruments, broadcasting and radio equipment, aviation equipment and fire alarm system.